Thousands of anchovies turned up dead in Southern California's Marina del Rey over the weekend after suffocating in the harbor, state officials said. A fish die-off like this hasn't been seen in recent memory at Marina del Rey, a coastal community just north of Los Angeles International Airport, said Carol Baker, a spokeswoman for the Los Angeles County Department of Beaches and Harbors. Now, investigators with the California Department of Fish and Wildlife think they have the answer: The anchovies most likely became trapped in the harbor and died of oxygen depletion. "While conducting an aerial survey over the beaches last week, staff noticed a large anchovy school traveling outside the surf," CDFW officials said in a statement. "We suspect these were the same ones later found in the harbor, and may have sought cover from a predator species. Once in the harbor, the fish school became trapped, and subsequently depleted all of the available oxygen in the water." Authorities were first alerted to the foul-smelling mess Saturday night (May 17), and county officials used large nets to scoop out the carcasses. On Sunday, they filled about 175 30-gallon (114 liters) bags with fish; each bag weighed 30 to 40 lbs. (13 to 18 kilograms), Baker told Live Science. As of Monday afternoon, there was still more work to be done, as dead fish that had been lurking below the surface were still floating to the top, Baker said. CDFW officials said fish die-offs are not unusual, but they collected samples of the carcasses for further analysis. 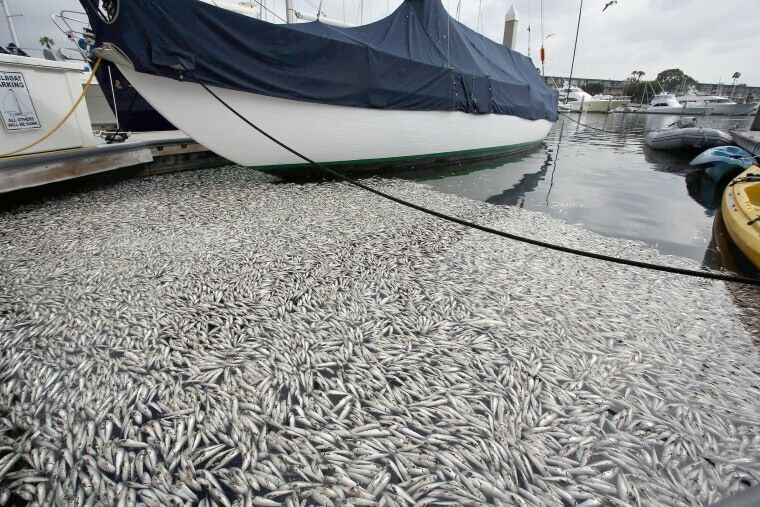 Low oxygen levels were blamed for the die-off of millions of sardines discovered one morning in March 2011 at King Harbor Marina in Redondo Beach, California. At the time, the Los Angeles Times reported that researchers found toxins in the dead fish that suggested a noxious algae bloom may have contributed to the mass kill. Algae blooms can consume massive amounts of oxygen in the water, creating dead zones. Some species of algae even produce neurotoxins that are deadly to people. For example, humans can die of paralytic shellfish poisoning if they eat shellfish that have fed on Alexandrium catenella, a type of algae responsible for so-called red tides.